Over the past 7 days, the Russian air grouping in Syria has performed 468 sorties including 24 sorties performed from the Russian territory by Tu-22M3 long-range bombers. 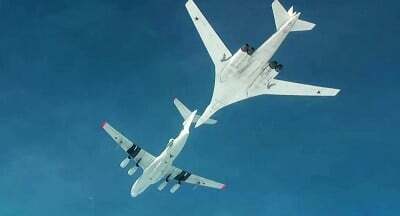 The Russian warplanes destroyed 1,354 terrorist facilities in the Syrian provinces of Aleppo, Latakia, Hama, Homs, Damascus, Raqqa, Daraa and Deir-ez-Zor. The Syrian Arab Army (SAA) and the National Defense Forces (NDF) have cut two main supply lines of ISIS militants in northern Aleppo Province: the Masqan-Aleppo and Haras-Al-Bab roads. The roads were cut in the attacks of the Syrian fighter jets and the army’s artillery units. The Syrian forces also advanced on Mazra’a Al-Malaah from the nearby village of Handarat. The violent clashes are going there. These farms controlled by terrorists lies on the way to the strategic village of Ard Al-Malaah. On Feb.1, the Russian Defence Ministry officially confirmed that SU35 fighters have been deployed to the Khmeimim airbase in Latakia. Su-35S fighter jets started performing combat missions last week. Previously, the Russian air grouping in Syria had only modernized Su-25 fighter bombers, Su-24M bombers, Su-34 jets and Su-30SM fighter jets providing cover for these planes. Also, the Varyag guided missile cruiser equipped with the Fort system and an S-400 long-range missile defense system deployed in late November are providing air defense of the base. The decision to deploy the SU35 to Syria is allegedly linked to more Turkish threats to shoot down Russian aircraft. According to Turkey, a Russian SU34 violated Turkish airspace on Jan.29. It was denied by Russia. The Russian Defense Ministry also presented video evidence it says shows Turkish military shelling Syrian territory using heavy artillery positioned close to the border. The video is irrefutable proof that Turkey concentrated a strong military grouping at the Syrian border. This grouping could be used for illegal military intervention to the Arab country. The top US commander for military operations in Syria and Iraq, Army Lt. General Sean MacFarland, said on Feb.1 that there is a “good potential” that more American and coalition forces will be needed to fight ISIS. In other words, the US-backed forces in Syria show not enough progress amid the advances of the Syrian government forces supported by Russia and Iran. Thus, the US urgently needs some success on the ground to strengthen its attitude in the ongoing negotiations on the solution of the Syrian conflict.